May 22, 2017…Lupines, planted from seed last year are bringing in the bees. When I saw all the bees on the Lupines I got out the camera. 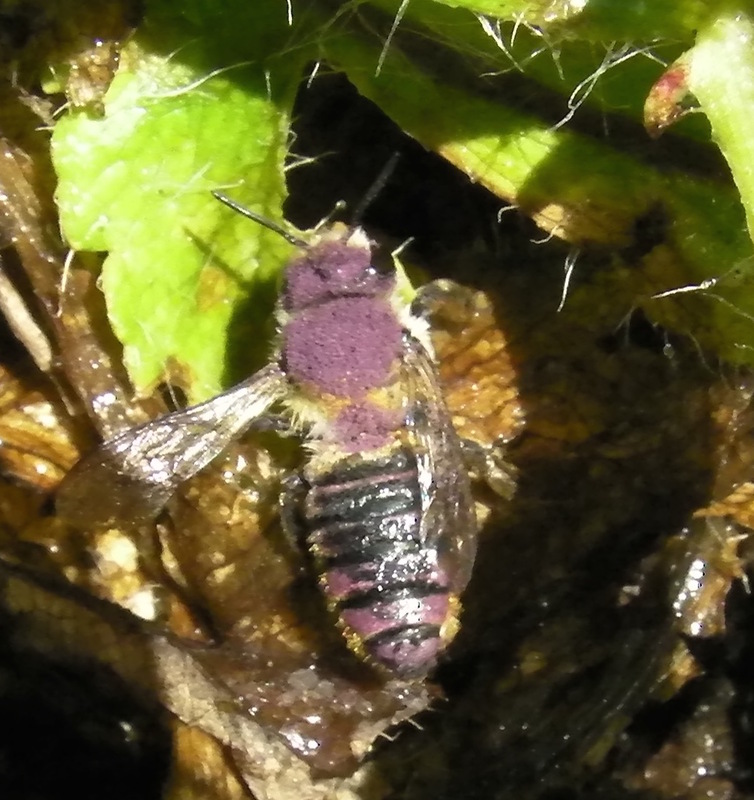 I noticed the bees would land on the bottom petals (referred to as ‘wings or sails,’). They would separate and what looked like a spike (referred to as a ‘keel’) would rise up. When the bee lifted off, the petals (wings) snapped shut over the keel. I had to find out more, so I consulted with Darcy Grahek of “Go Native Nursery,” at Bandon High School. Darcy said that the stigma (female parts) AND the anthers (male parts) are contained within the keel. May 30…Bee lifts off lupine blossom after rubbing it’s body on the ‘keel.’ Petals (or ‘wings’) will close over keel. 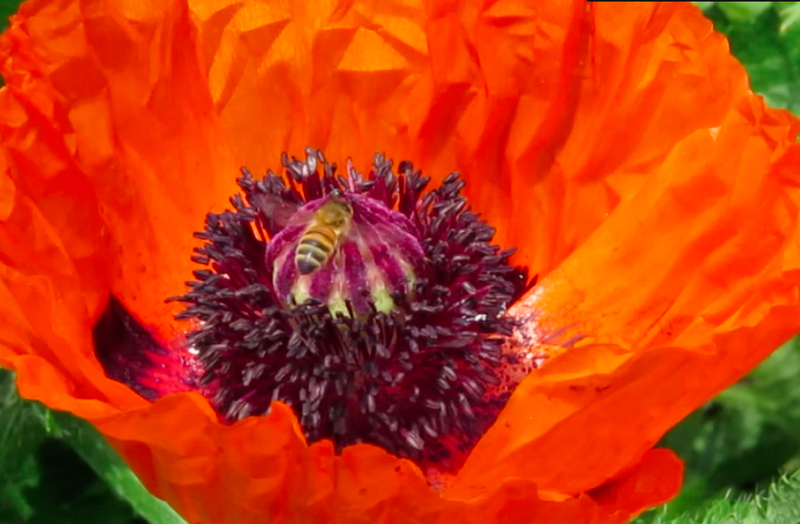 Watching the video, you’ll see the stigma poking up through the tip of the keel after the bee lifts off. By rubbing it’s body on the keel, the bee pollinates the flower when the anthers touch the stigma and the bee picks up pollen. For a more detailed explanation scroll to lupin in Sexual Reproduction in Plants, by Johny Thomas. 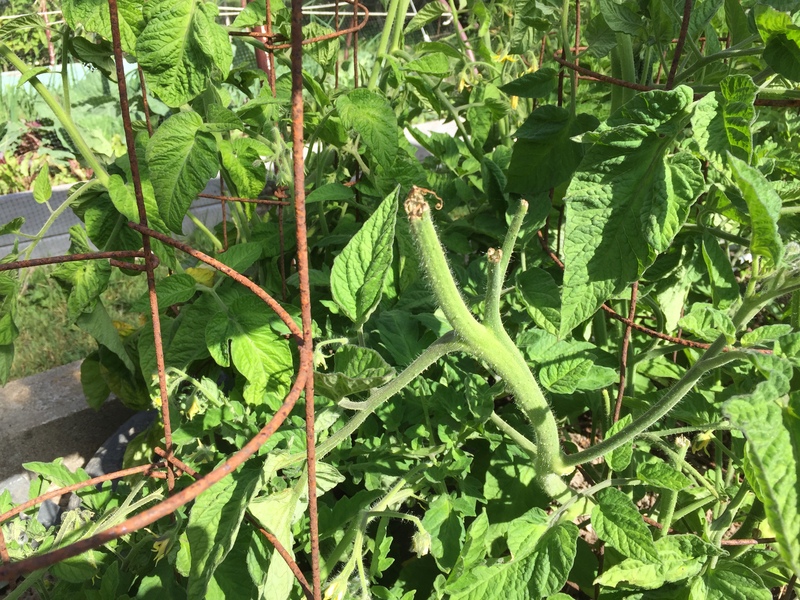 I pulled off the outside petals (referred to as sails or wings) of the keel, revealing the pollination parts of the flower. The female part is the stigma (longer). The male parts are the anthers which can be seen atop the (shorter) filaments. When the bee rubs it’s abdomen against the keel, the pollen on the anthers comes in contact with the stigma and pollination occurs while the bee is rewarded with grains of pollen. Win-win. The Bird’s Foot Trefoil uses a similar type of pollination. Many thanks to Gerard van Duinen of La Tabù, for giving me permission to use his delightful composition, Hijo #1, in the video. The new Echium Bee Bed is filling in well. 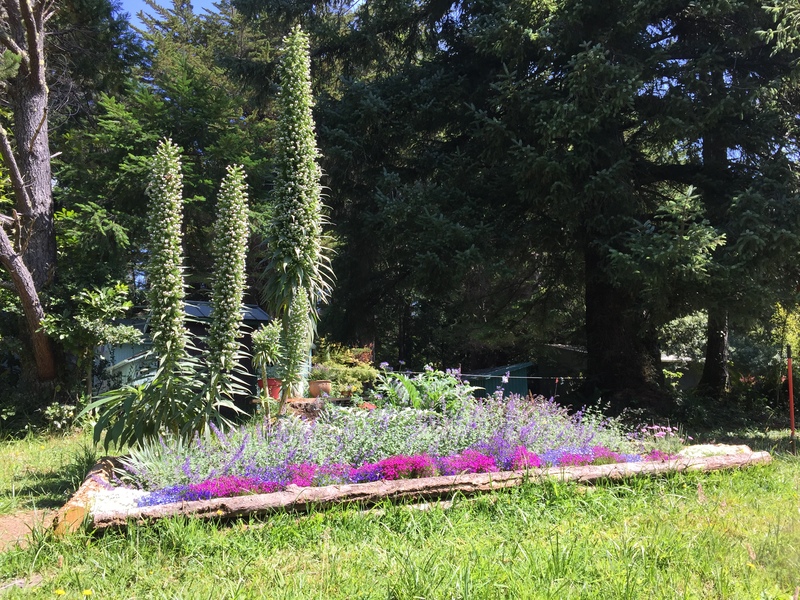 From the colorful lobelia in front to the tallest Tower of Jewels echium plant, they all attract bees. 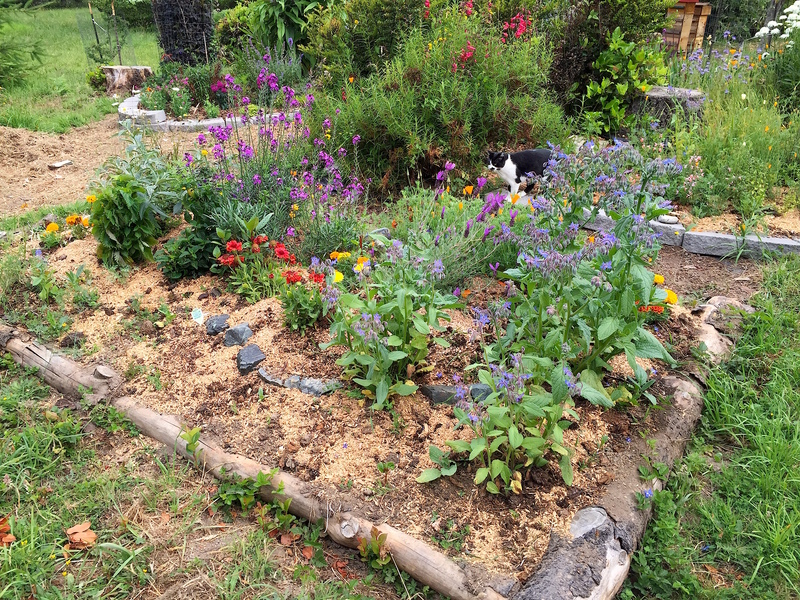 July 3…The Hugelkulture bed is looking so much better since we weeded, planted, and mulched with compost and wood chips. 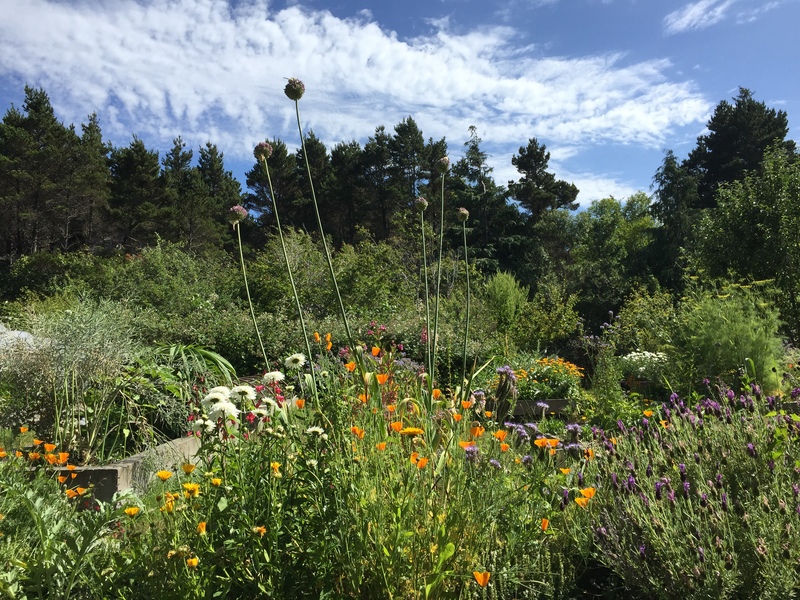 A view from our garden bench in July reveals the garden in full glory. 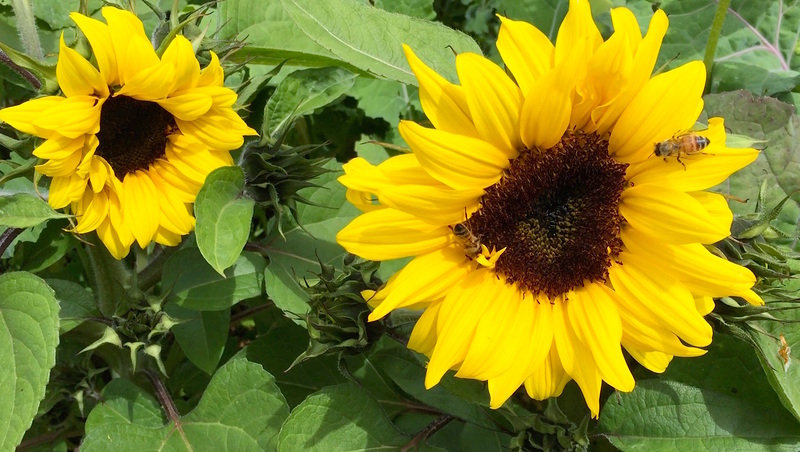 July 3…The dwarf sunflowers are open and attracting bees already. It’s older siblings can only watch with envy. 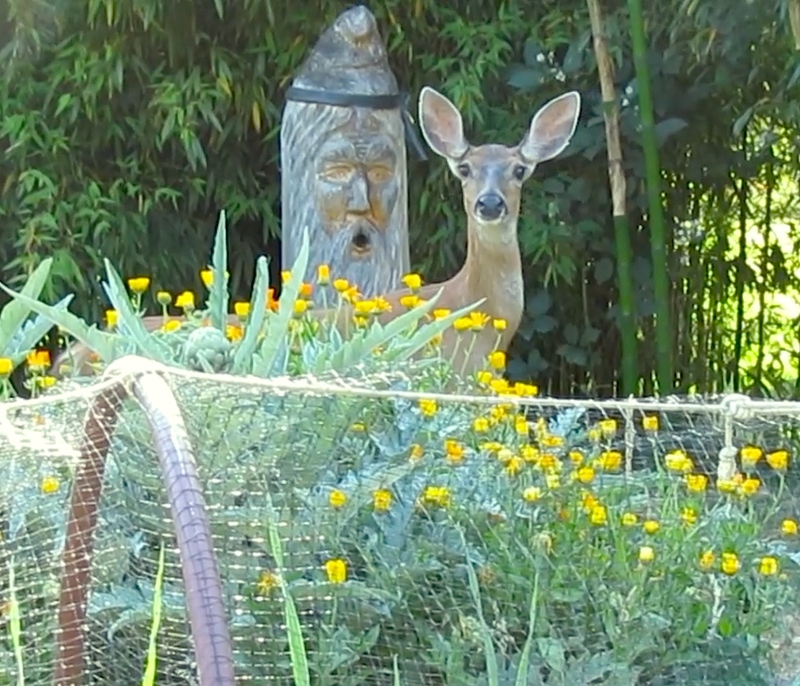 This deer seems to be asking me the question…”What are you doing out here at this time in the evening, this is MY time?” In the video you’ll see why she looked up…she picked up the sound of the camera’s zoom lens. Their hearing is phenomenal, but luckily their eyesight isn’t that good. I’m standing in the sunlight just a short distance away, but she can’t see me very well. 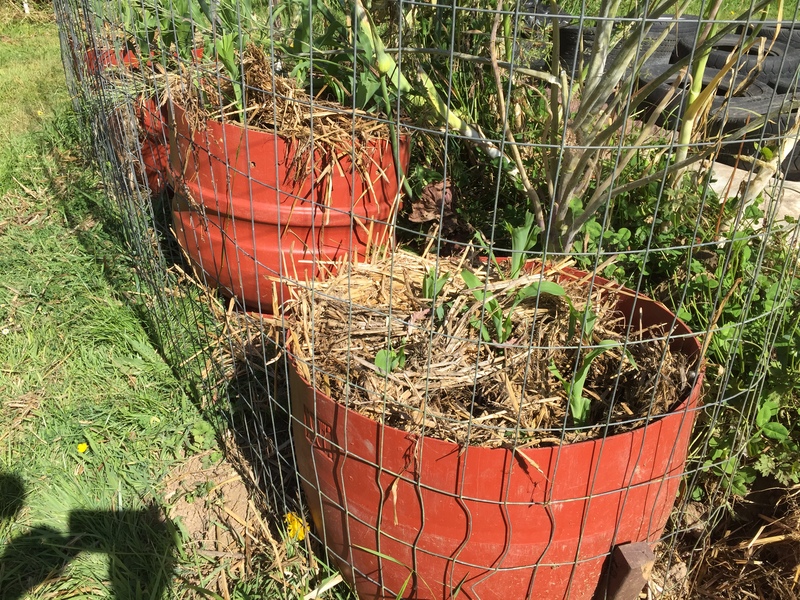 I mulched this corn in the morning…by the afternoon, the deer had already sampled it. A temporary fence is now in place to protect it…I hope it recovers. 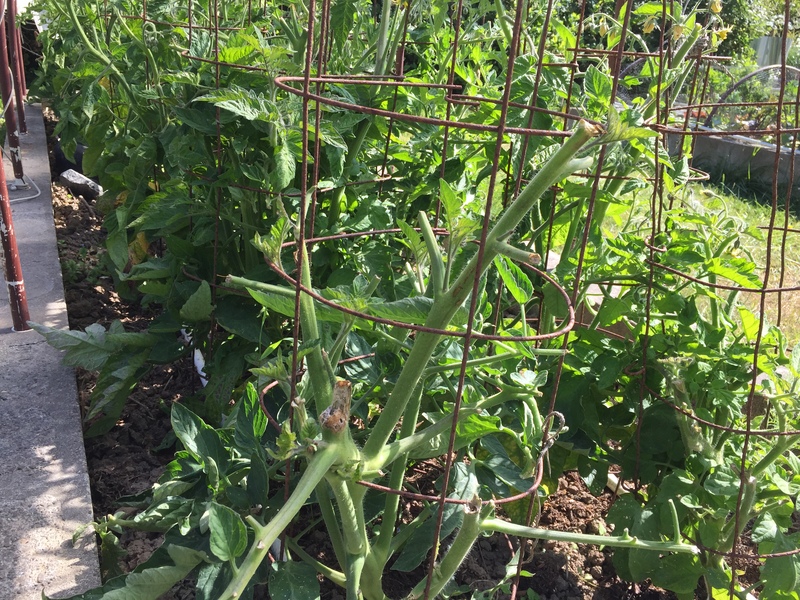 This tomato’s only crime was to be planted at the end of the bed where the deer could reach it easily. 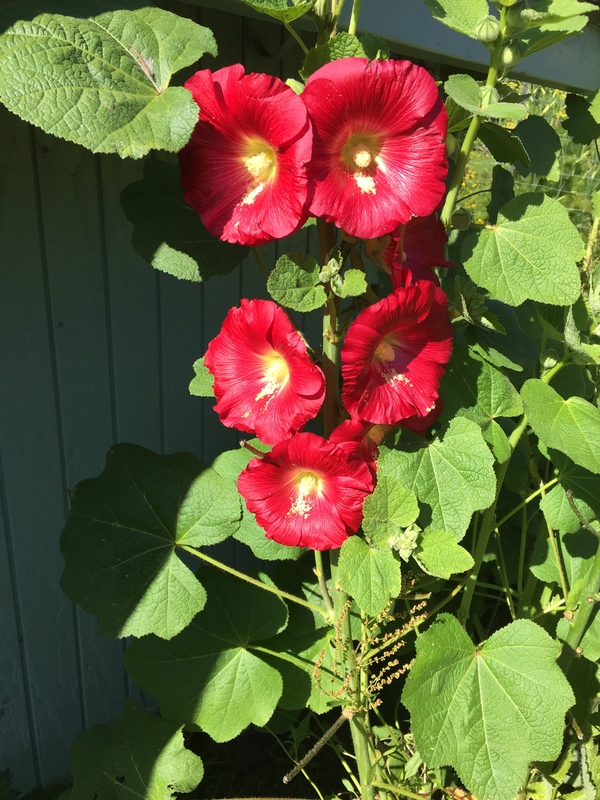 Planted from seed last year, these Hollyhocks have survived the deer twice. We’re so happy to finally see the blooms, but we’ve yet to see any bees on them. 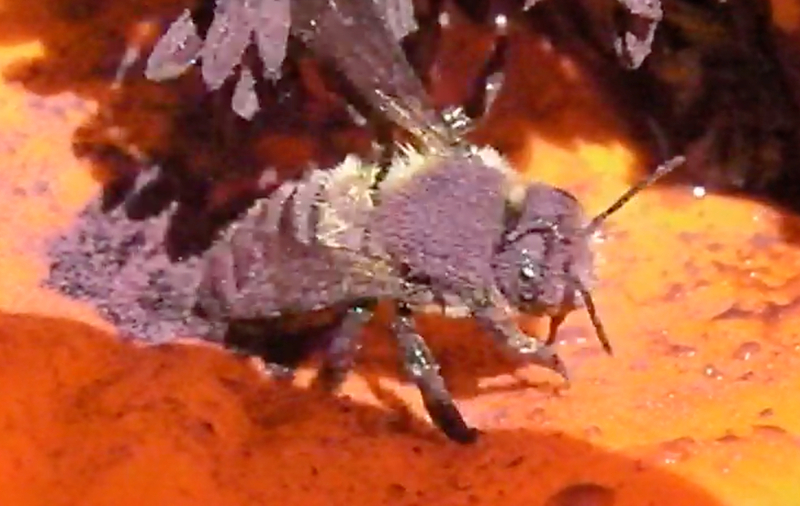 A frame from the video shows the bee covered with purple pollen. This bee fell from the poppy which was wet from the sprinkler. I spotted it here before it took off. 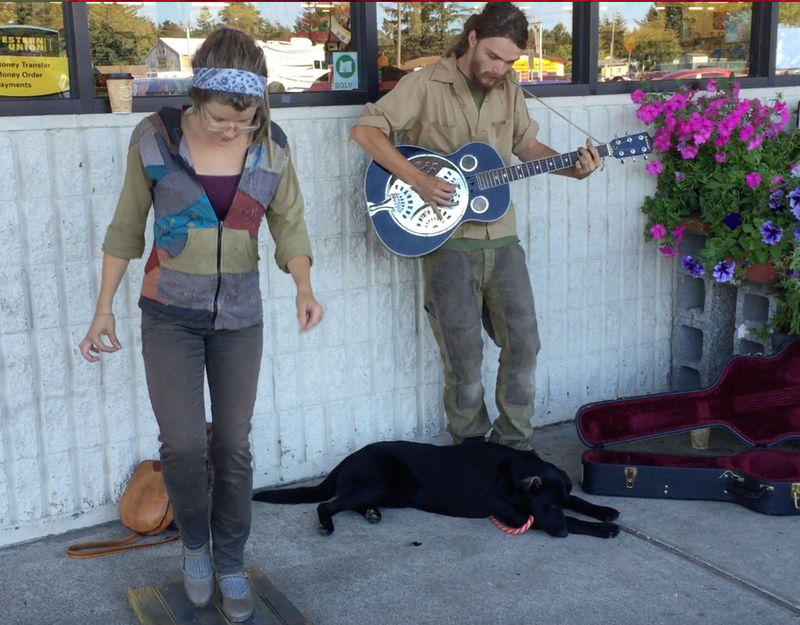 June 19…Unidentified street performers provide the perfect background music for the bee gathering poppy pollen video. 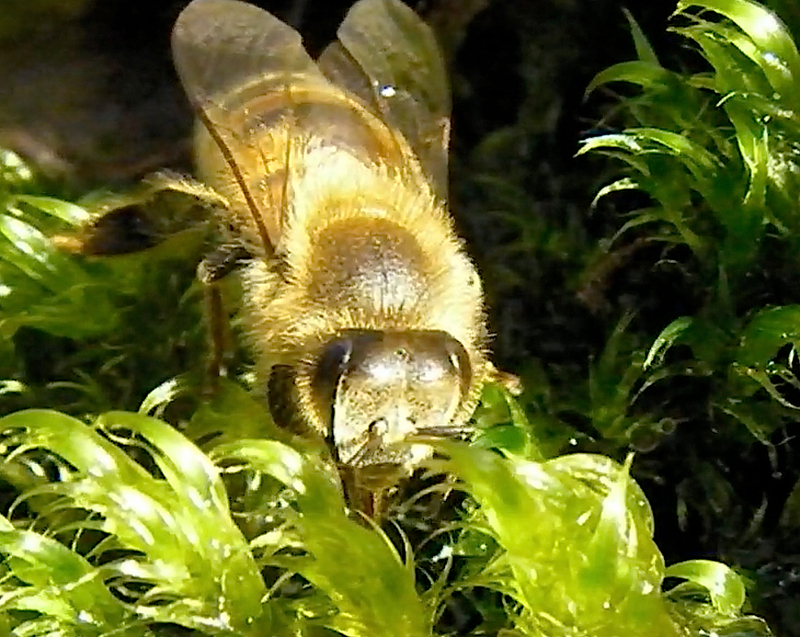 Bees Like Old Leaves and Moss? 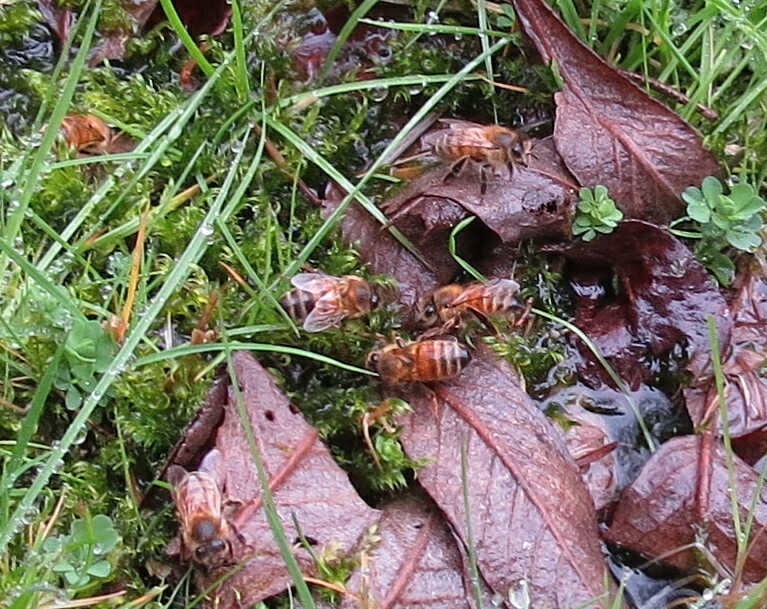 A couple of weeks ago we started seeing bees gather in a little pond beneath the willow tree. It looked like they were sipping the water where moss was growing. 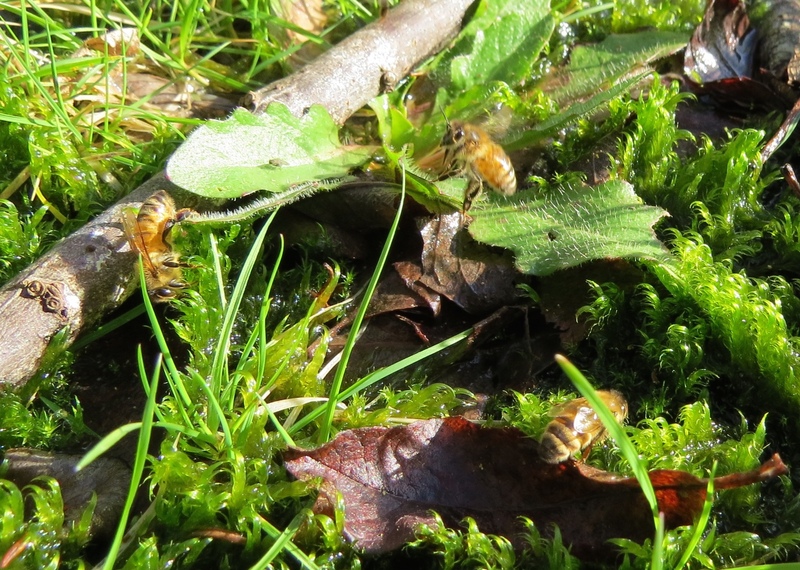 January 22…Three bees spotted on this patch of moss. 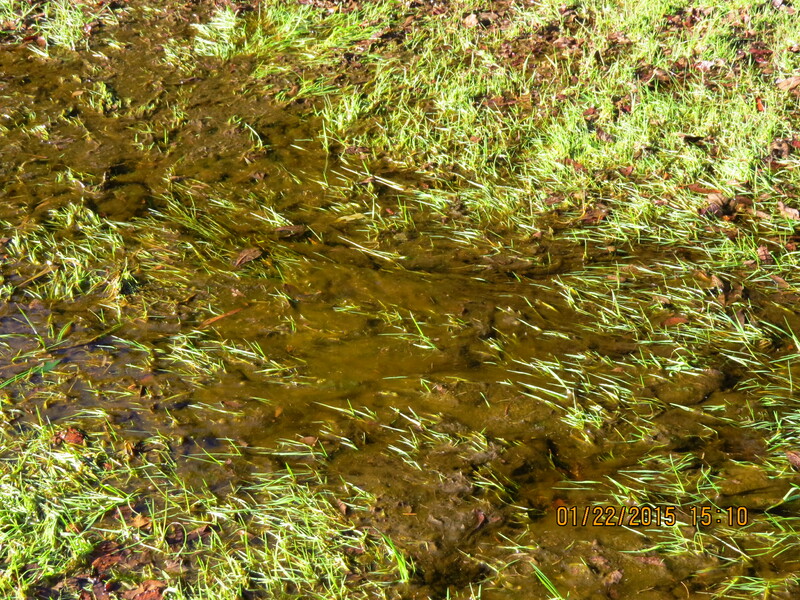 January 22…I’ve heard bees like “dirty” water, so I guess this mossy water is no surprise, but I wonder what they’re getting out of it. Feb. 2…Being a day of steady drizzle, I checked again to see if the bees were here. Yes, this time I saw more bees. They are truly dedicated bees. 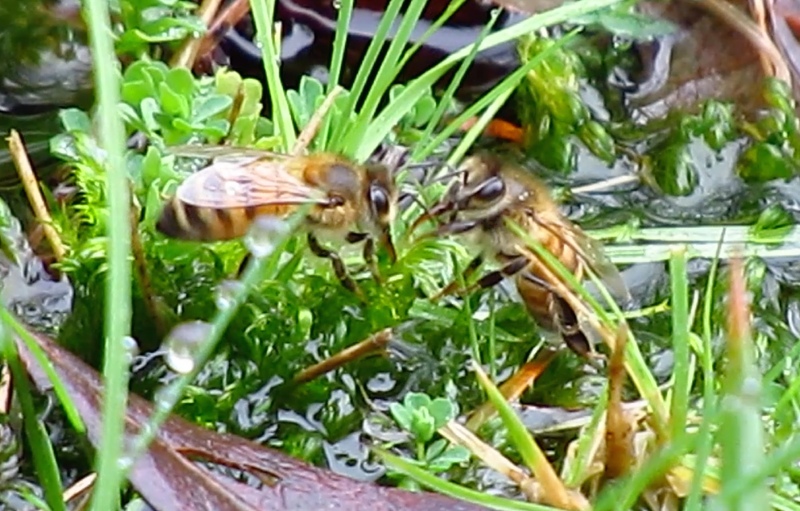 February 3…this photo is taken from a video when it was raining, but it still shows bees that are visiting the moss even though the water is covering most of it. 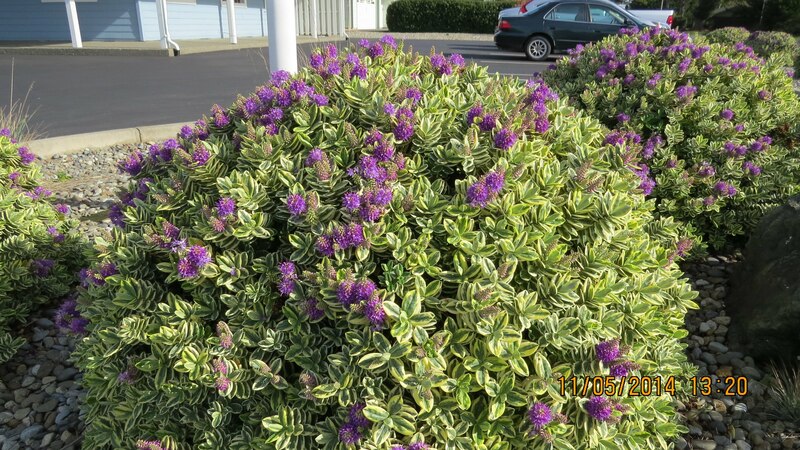 November 5, 2014…On an unusually warm November day, I spotted these hebes growing in front of Bill Sweet Insurance Agency. The bees were loving it. Thanks, Bill. While the east coast is getting hammered by the polar vortex cold weather, the west coast is enjoying warm sunny days into early November. At this time of year there are very few sources of nectar, so it’s good that the honeybees are getting a lot from the hebes. 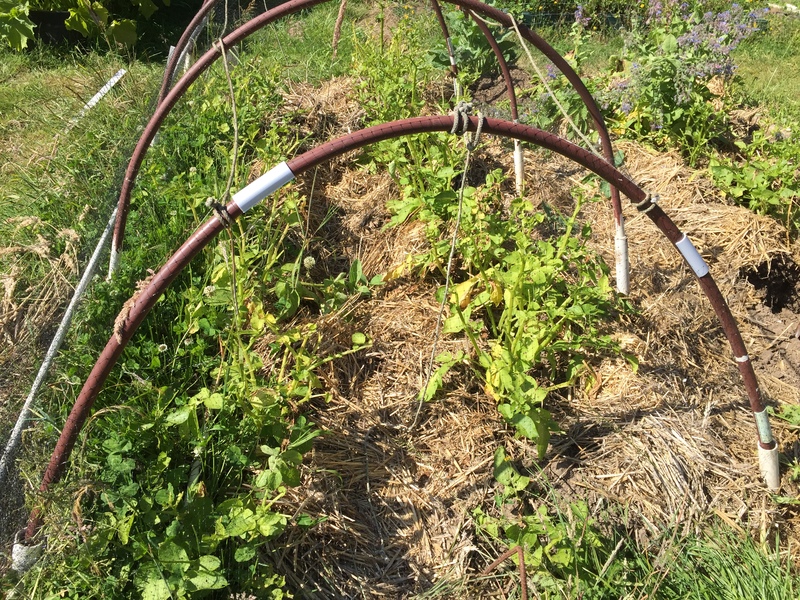 Nectar provides an important energy source (carbohydrate) for the bees. Many thanks to Steve Montana for permission to use his music. …and gets it from the honeybees! June 2, 2014…This pink poppy (Pink Princess) just opened up this morning. 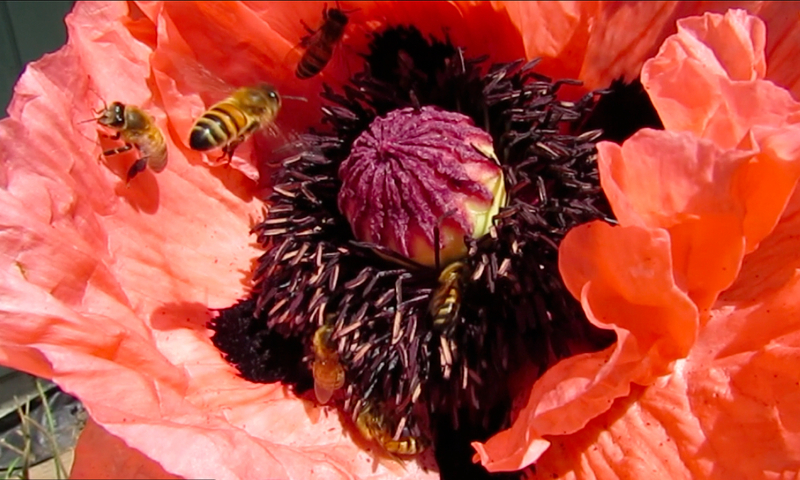 The honeybees seem to favor it over the red poppies..